Forum » General Discussion / Fan Work » An SCP Light Novel? According to the website synopsis, the plot is about a guy who gets pulled into a containment site by SCP-105, and soon accompanies her as he learns the mysteries of the SCP. SCPs featured in the novel will include 105, 458, 529, 963, 1048, and 40-jp. I have a baaaaad feeling about this. Especially considering that the main characters seem to be Some Japanese Guy and 105. Re: An SCP Light Novel? I can't see many ways this can end but bad. Netflix'l try and pick this up for sure. To be fair, that art is fricking gorgeous. Was it made for that book or is there any source for it? That Foundation is certainly very different than what we generally see in this site. I could see one or two way it could be interesting, but I can't ignore the larger probability of it being a cheesy love story spiced with SCP undertones, or worse, a harem. Oh well, so long as there are no licensing dispute. Reckon publishing companies would be uptight about that stuff. I am guessing either the differences in Japanese IP law or the fact that printing graphic fiction requires huge overhead is why this is even possible. Under CC you should be able to just copy it and resell it, but that's not cheap at the same production values and print runs. I doubt that Netflix is going to invest in an anime version under CC though, since it's trivial to copy digital media. Yeah, now that I see closer it was listed in the page linked on the original post. Got quite a few of cool works too in her pixiv. "The protagonist who experiences the anomaly of [Whenever he opens book, there is always a photograph of a girl stuck inside it]. One day, the instant he opened a book in a library, he was transported to an unknown place." "In a place like a dreary prison, in front of him was the girl in the photographs. Her name was [Iris]. And the place known as the [SCP Foundation], a facility which Secures・Contains・Protects the [Existences outside of common sense]." "As a [D-Class], the protagonist takes action with Iris, but…"
"An original novel release of the expanding Open Shared World [SCP-Foundation]!!" So they abided by the staple of light novel tropes. This might be one of those guilty pleasure things. 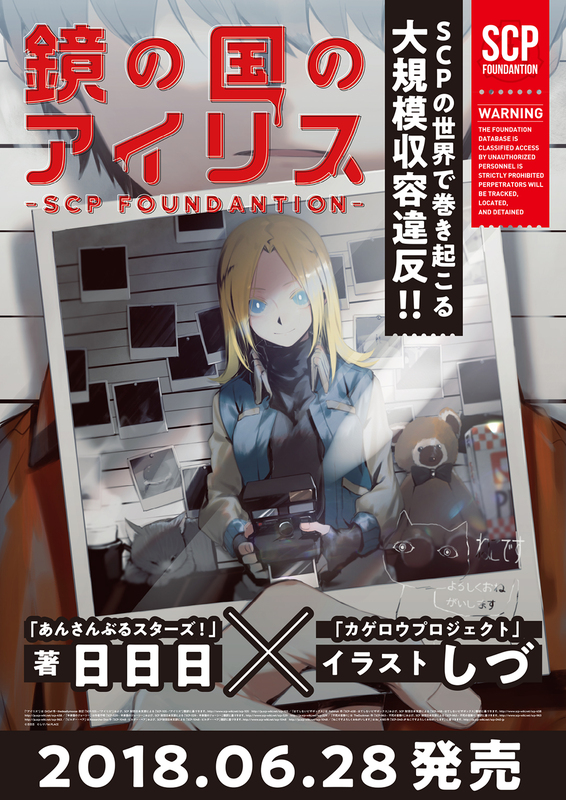 EDIT: And the cover references a -JP SCP (http://ja.scp-wiki.net/scp-040-jp). Yeah, no, it's definitely going to be an isekai. One, it seems, featuring SCP-105 as the (/a? I would not put it past this kind of story to do a harem) love interest. And as indicated above, the only non-Safe SCP mentioned surrounding it is the Builder Bear. My understanding of the usage rights is that anyone can legally upload the entirety of this manga, right? Please do. Also, thankful that 076, 682, 106, and 049 aren't mentioned as being in it. A light novel isn't a manga. It's basically a novel, generally with smaller form factor, hence the term "light". It has emphasis on illustration, like one or even two illustration per chapter, but the storytelling is done by text. But yeah, Baka-Tsuki wouldn't be infringing copyright on this one. It's not a manga, it's a light novel. In other words, a story in simple Japanese with a few pictures. How can I buy this when it is realized? Some sample books have been distributed in an event, and AFAIK, overall reaction from active and active-ish authors in JP branch was — surprise — positive. Yet they pointed out one problem, and that was it's like you explaining the SCP Foundation for friends or family. I guess it'll be less problematic in the end, because it may be only a short snippet from an introductory part of long-ish series. I agree with the many reviewer's view (I couldn't afford to participate in the event, so I've never seen the book by myself) that the license part on the website is only for the cover art, and suspect SCP-040-JP (and, maybe even SCP-1048) would never show up in its main story line, being just some cameo appearance because of popularity in the Japanese fan base. And one of those who received the sample book said they think Dr. Bright could be the mastermind behind the incident. Really? It can be they are just joking or wanted to point out SCP-963-1, but if it's the case, it may be viewed as worse omen than cheesy harem or isekai things for some.